The Edanz Author Academy has been developed to meet the needs of international researchers and authors just like you. The Academy aims to provide you with insight and knowledge that will help you at every stage of the publication process. Study the entire course at your own pace or pick the area you would like to learn more about and start from there. 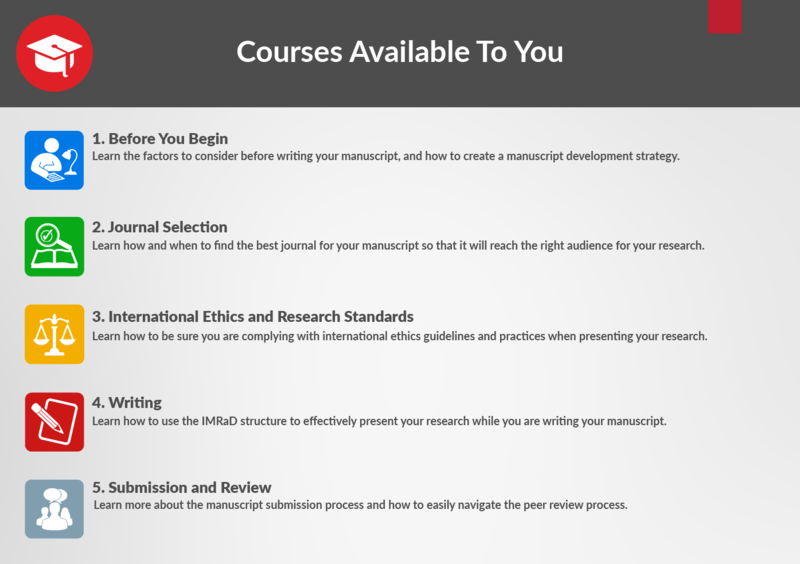 Use the insight and knowledge from these courses and be confident you are presenting your research clearly, and that your manuscript meets the standards required by international journals. The course content has been developed by the Edanz Education and Engagement Team and our Education Director and Senior Publishing Consultant, Dr Trevor Lane. All course developers have a deep understanding of academic writing and are experienced in training researchers and authors to publish in international journals. Please see below for course information and registration details. To use the Author Academy you first need to register with Edanz. Follow the steps below to compete registration. Once you have completed registration, visit the link below and login to get started. If you are already registered with us, you can simply visit the link below and login to get started.